Principles of patient- and family-centered care (PFCC) have been ingrained in American culture since the days when house calls were made by the fictional Marcus Welby, MD, and the real Dr. W. Mayo (Clapesattle, 1990). It would be unusual for a modern medical practitioner to argue against these principles, but gradually over time, the practical application of patient- and family-centered care in clinical settings faded. Now PFCC is considered again to be both innovative and controversial. The Institute for Patient- and Family-Centered Care (IPFCC), an internationally recognized authority on the topic, characterizes PFCC as “an innovative approach to the planning, delivery, and evaluation of health care that is grounded in mutually beneficial partnerships among healthcare patients, families, and providers.” PFCC is based on respect, information sharing, participation of patients and families in decision-making, and collaboration (IPFCC). Prominent healthcare leaders have proclaimed the need for PFCC. Most notably, Dr. Donald Berwick, former administrator of the Centers for Medicare and Medicaid and CEO of the Institute for Healthcare Improvement, has called for incorporation of patient-centeredness in current care systems (Berwick, 2009). Additionally, in 2008, the IPFCC published a report outlining the core concepts and recommendations for advancing PFCC (Committee on Hospital Care, 2012) and has made available resources for successfully implementing family-centered care (Moretz & Abraham, 2012), which have been used by hundreds of healthcare organizations. The Joint Commission has established standards and gives guidance to hospitals implementing PFCC (The Joint Commission, 2010). While logical thought and public pressure direct us toward more thorough implementation of patient and family engagement practices, there is also a concurrent effort to provide an evidence base for family-centered care (Kuhithau et al., 2011). This article on bedside inpatient rounds is the first in a series that will focus discussion around a specific real patient, Max, and his family. Told from Max’s mother’s perspective, the story illustrates how her desire to form a partnership with her child’s healthcare team enhanced Max’s care. Max’s parents’ journey was filled with numerous challenges, which provided opportunities to advance partnership with caregivers. In the end, Max’s parents became integral in the care process. Although the story focuses on a pediatric patient and his family, the lessons learned are applicable to the adult care setting as well. Organizations seeking guidance on how to engage leaders and staff in this process have found that personal stories make a compelling case for change. The series will review current science and best practices related to key situations where PFCC can be tangibly incorporated into clinical work. Best practices are drawn from both academic and community hospital settings to reflect the variety of approaches taken in implementing PFCC. In addition to PFCC bedside rounding, the topics we will address in the series include family presence during resuscitations and invasive procedures, communication during care team transitions or “handoffs,” and disclosure of medical errors. These topics are particularly relevant to clinicians at the forefront of the provision of PFCC. We hope to offer guidance to all who want to optimize the involvement of patients and families in clinical care processes. My son, Max, was born on a Sunday afternoon, August 17, 2003. He turned blue during his first bath and within hours of birth underwent emergency open-heart surgery for total anomalous pulmonary venous return (TAPVR). My husband and I spent a total of three weeks in the hospital with our son, including the five days Max spent on extracorporeal membrane oxygenation (ECMO). Like many families with very sick children, we practically lived at the hospital and were quite dazed. Max’s cardiologist must have drawn Max’s defect for us a dozen times. A nurse had to write out what TAPVR stood for — we just couldn’t grasp all those exotic words. Luckily, no one expected us to “get it’” all, instead waiting for moments when we were relatively clear-headed to patiently explain how the ECMO machine worked, or what his “sats” meant. Interacting with his medical team each morning helped lead us along our learning path. The Consortium for Maximizing Family-Centered Care was established during a panel presentation at the “One Voice: Patient- and Family-Centered Care” program at the Mayo Clinic in Rochester, Minnesota, on November 13, 2008. Since that time, members of the Consortium (listed below) have collaborated on this series of articles. * This series is dedicated to Pat Sodomka, an internationally recognized leader in patient- and family-centered care whose work in the One Voice Program at Mayo Clinic helped form the basis for these articles. She passed away on February 19, 2010, but her legacy continues to inspire the patients, families, and staff whose lives she touched. About three decades ago, healthcare teams, especially physicians, migrated away from traditional bedside rounds and, thus, away from direct interactions with patients and families (Lehmann et al., 1997). Physicians and other providers have been pulled away from the bedside to conference rooms and computer terminals. Growing volumes of complex inpatients and pressure on the “bottom line” have placed a premium on efficiency. Patients, families, and advocacy groups raised concerns about how the healthcare system has failed to meet many of their basic communication needs and tried to draw healthcare teams back to the bedside. Key aspects of PFCC rounding include family choice, defining roles and responsibilities, “setting the scene,” and an attitude of teamwork/collaboration (Cincinnati Children’s Hospital). Patients, as appropriate, and their families should be asked if they want to be include in bedside rounds. Some may desire this level of participation and others will not. It’s important to tailor these activities to the unique needs and desires of individual patients and families. It’s also essential to identify and define the members of the team and the roles and the responsibilities of various participants. Details about when rounds will take place, who will present information, and how patients and families participate need to be addressed from the outset. Patients and families should be encouraged to write down questions in advance of rounds. Setting the scene occurs daily upon entering the patient room and involves one designated participant introducing key members of the team and encouraging the family to take an active role in clarifying information and contributing to the plan for care (Cincinnati Children’s Hospital, Family Centered Rounds Basics; Fischer, 2008). This type of collaboration is essential. In some settings, such as neonatal intensive care units, where families might not be rooming in with the child, the timing of PFCC rounds can be adjusted to fit best with the family’s availability. My husband and I found that meeting with the clinical team every morning began the educational process. In essence, these meetings fostered our desire to partner with the team. In turn, the clinical team respected and valued our involvement and recognized the importance of including family members as full partners in our son’s care. 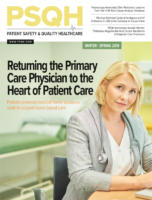 For more than a decade, the American Academy of Pediatrics (AAP) has recommended that family-centered care be incorporated into all aspects of professional practice including attending physician rounds. The AAP also recommends that patients and families be encouraged to participate actively in the management and direction of their own healthcare (American Academy of Pediatrics, 2003). Nevertheless, concerns from healthcare teams (physicians in particular) about additional time required for rounds, the quality of teaching, and patient confidentiality remain barriers to implementation (Muething et al., 2007). Physicians in training seem comfortable with case presentations at the bedside and report benefits from family-centered rounds but often are more comfortable asking questions and responding to questions asked by the faculty when not at the bedside (Landry et al., 2007). Janicik and Fletcher (2003) demonstrated that there was no significant decrease in the amount of time spent teaching when family-centered rounding was implemented. Models have been proposed to teach effective bedside teaching (Janicik & Fletcher, 2003; Ramani, 2003) and instruments have been developed for evaluation (Beckman et al., 2003). Participation in family-centered rounds provides improved opportunities for assessment of trainee competence in communication (Osorio et al., 2012). Indeed, training in respectful communication with patients and families is widely seen as a critical aspect of PFCC (Philbert et al., 2011). Specific pre-rounds preparation can help trainees gain competence in communication during rounds (Young et al., 2012). In a neonatal unit, collaboration between staff members improved with implementation of family-centered rounds as did parental satisfaction regarding communication with care providers (Voos et al., 2011). Nonetheless, institution of family-centered rounds does not necessarily improve family understanding of discharge plans (Subramony et al., 2012). In at least one setting, though, families involved in family-centered rounds report more consistency in medical information, more opportunity to discuss care plans, and a greater sense that doctors listened and showed respect (Zou et al., 2012). Muething et al. (2007) found that despite concerns for patient confidentiality, families usually request involvement in these rounds. In a pediatric intensive care unit, 94% of families reported that hearing medical discussions about their child was not upsetting (Lehmann et al., 1997), and Rosen et al. (2009) found that patient and family input commonly affected the medical decision making of the team. Together, these findings suggest that family-centered care and family-centered rounding can result in positive impacts on patient and provider satisfaction and on educational efforts. Bedside rounding even has the potential for improved clinical outcomes (Sisterhem et al., 2007; Latta et al., 2007). How does a hospital service transition from conference room-based rounds without families or patients to fully integrated bedside PFCC rounds? Rather than follow an imposed process, various groups at Mayo Clinic implemented PFCC in a customized fashion. The General Pediatric Hospital Service at Mayo Clinic took a stepwise approach. First, in 2006, the planning team discussed the idea broadly with faculty members, nursing leaders, staff, and trainees, and included representatives of the Patient and Family Advisory Committee in the discussions. Importantly, they ensured the participation of skeptics in the planning. Second, the team began with a two-month “pilot project” that included implementing bedside rounds for a defined period of time and then discussing what worked well and what didn’t. They then addressed whether to make bedside PFCC rounds standard; in fact, by the end of the pilot project, there had already been so much discussion, with growing enthusiasm, that most everyone involved had already “bought in” to bedside rounds. Third, the team prepared tangible workflow guidelines for how to do patient- and family-centered rounds at the bedside. These specified which team member should enter the room first (the trainee who was “presenting” the patient to the group) and how people would be introduced. These guidelines also established procedures to ensure that the bedside and charge nurses would be present with the team and provided templates for the key information to present. Fourth, as bedside rounds became routine, they included videos of rounds in the orientation of students and residents prior to their arrival on the hospital service. (See Table 1 on page 22 for a summary of key points.) Fifth, the team elicited ongoing input from all involved to evaluate and modify practices; this prompted reminders to use the call button to get the nurse into the room if not already there and supported a review of the process of family-centered rounds each time new trainees joined the team. Identify initial speaker prior to entering room (usually the trainee presenting the patient). Discuss family-centered rounds with patient and family ahead of time; allow them to “opt out” if they want. Ensure that all team members are present. Introduce everyone in the room, at least by role and/or relevance to patient’s care. Solicit questions from the patient and family. Review plans and goals after the presentation; confirm understanding by all. Validate input from each team member. Leave summary plans for the day on an in-room communication device (such as a white board). Forget to warn the patient and family ahead of time that a big group will be coming. Apologize for the size of the group in the room. Get distracted by the television or other technology (such as iPad). Speak negatively about previous care providers. Ignore family responses and body language. Neglect to follow through on plans for the day. Fail to return later if clarifications needed or new information forthcoming. Forget to tell the patient/family how to make contact with members of the team if needed. The intensive care units (ICUs) at the North Shore Medical Center (NSMC) in Salem, Massachusetts, used a different approach to implementing patient- and family-bedside rounds. Initially, implementation was met with some concern, particularly among physicians who worried that family presence would lengthen rounds, decrease candor of information exchange between team members, and decrease family’s trust through exposure to the uncertainty that exists in medicine. Additionally, they worried that house staff would be far too nervous and teaching would suffer as attendings would be less willing to correct house staff on rounds. Given these concerns, the ICU leadership used a quality improvement approach by conducting a small test of change. In this case, a physician and nurses from each of the two ICUs piloted the program and found that none of their fears was confirmed. Moreover, they learned that patients seemed appreciative and relieved to hear “all of it” rather than being made more anxious or distrustful. The early adopters then became champions in supporting family presence on rounds, which has been highly successful. The Cardiac Surgery Unit at NSMC created the expectation of family-centered rounds when the unit opened in 2003. Whiteboard guidelines were developed to insure that daily goals were patient- and family-centered as opposed to provider specific. This rounding process has improved team communication by engaging the patient and family in setting goals. In addition, it has improved efficiency by minimizing the number of family meetings required and is thought to have contributed to high patient satisfaction scores and a low rate of staff turnover. These examples of implementing bedside rounds in a variety of clinical settings demonstrate that different approaches may be taken depending on the maturity of a PFCC program and extent of staff acceptance in creating genuine partnerships with patients and families. Mayo Clinic was able to use patient and family representatives from its Patient and Family Advisory Committee to assist in creating its model for bedside rounds, while the medical intensive care unit at the North Shore Medical Center obtained patient feedback post implementation to further strengthen staff consensus with its new model of care. Two factors were critical to successful implementation: taking into account the degree of staff acceptance and listening to the voice of patients and families. In regard to the latter, the power of personal patient and family stories is particularly useful in effecting change. These different approaches reveal that PFCC does not have to be fully implemented to advance this effort in an organization. In fact, healthcare organizations without a robust PFCC program would be well served by approaching this issue incrementally, as a small test of change. If successful, the approach can then be spread to other units. Jason Homme is assistant professor of pediatrics and pediatric residency program director at Mayo Clinic in Rochester, Minnesota. Maureen Connor is a healthcare consultant at Claremont Consulting Partners in Arlington, Massachusetts. She may be contacted at mconnor97@comcast.net. Valerie McCarty is coordinator at Mended Little Hearts of Southeast Minnesota in Rochester, Minnesota. Philip Fischer is professor of pediatrics at Mayo Clinic in Rochester, Minnesota. Homme, J. H., Connor, M., McCarty, V., & Fischer, P. R. (2014). Patient- and family-centered care: Advancing quality and safety with bedside rounding. Patient Safety & Quality Healthcare, 11(2), 20–24. American Academy of Pediatrics Committee on Hospital Care. (2003). Family-centered care and the pediatrician’s role. Pediatrics, 112(3), 691-696. Beckman, T. J., et al. (2003). Evaluating an instrument for the peer review of inpatient teaching. Medical Teacher, 25(2), 131-135. Berwick, D. M. (2009). What ‘patient-centered’ should mean: Confession of an extremist. Health Affairs 28(4), w555-w565. Clapesattle, H. (1990). The doctors Mayo. Rochester, MN: Mayo Foundation for Medical Education and Research. Committee on Hospital Care, The Institute for Patient- and Family-Centered Care. (2012). Patient- and family-centered care and the pediatrician’s role. Pediatrics, 129, 394-404. Fischer, P. R. (2008). From Gettysburg to a general hospital service. Patient Education and Counseling, 73, 3-5. Janicik, R. W., & Fletcher, K. E. (2003). Teaching at the bedside: A new model. Medical Teacher, 25(2), 127-130. The Joint Commission. (2010). The Joint Commission: Advancing effective communication, cultural competence, and patient- and family-centered care: A roadmap for hospitals. Oakbrook Terrace, IL. Kuhithau, K. A., Bloom, S., Van Cleave, J., Knapp, A. A., Romm, D., Klatka, K., et al. (2011). Evidence for family-centered care for children with special health care needs: a systematic review. Academic Pediatrics, 11, 136-143. Landry, M. A., et al. (2007). A randomized, controlled trial of bedside versus conference-room case presentation in a pediatric intensive care unit. Pediatrics, 120(2), 275-280. Latta, L. et al. (2008). Parental responses to invovlement in rounds on a pediatric inpatient unit at a teaching hospital. A qualitative study. Academic Medicine, 8(3), 292-297. Lehmann, L. S., et al. (1997). The effect of bedside case presentations on patients’ perceptions of their medical care. New England Journal of Medicine, 336(16), 1150-1156. Moretz, J. G., & Abraham, M. (2012). Implementing patient- and family-centered care: Part II – strategies and resources for success. Pediatric Nursing 38, 106-109, 171. Muething, S. E., et al. (2007). Family-centered bedside rounds: A new approach to patient care and teaching. Pediatrics, 119(4), 829-832. Osorio S. N., Ward M. J., Siew L., Bylund C., & Konopasek L. (2012). Assessment of pediatric residents’ communication and interpersonal skills during family-centered rounds. Hospital Pediatrics, 2, 85-92. Philbert I., Patow, C., & Cichon, J. (2011). Incorporating patient- and family-centered care into resident education: approaches, benefits, and challenges. The Journal of Graduate Medical Education, 3, 272-278. Phipps, L. M. (2007). Assessment of parental presence during bedside pediatric intensive care unit rounds: Effect on duration, teaching, and privacy. Pediatric Critical Care Medicine, 8(3), 220-224. Ramani, S. (2003). Twelve tips to improve bedside teaching. Medical Teacher, 25(2), 112-115. Rosen, P., et al. (2009). Family-centered multidisciplinary rounds enhance the team approach in pediatrics. Pediatrics, 123(4), e603-e608. Sisterhen, L. L., et al. (2007). Defining family-centered rounds. Teaching and Learning in Medicine, 19(3), 319-322. Subramony, A., Schwartz, T., & Hametz, P. (in press). Family-centered rounds and communication about discharge between families and inpatient medical teams. Clinical Pediatrics. Voos, K. C., Ross, G., Ward, M. J., Yohay, A. L., Osorio, S. N., & Perlman, J. M. (2011). Effects of implementing family-centered rounds in a neonatal intensive care unit. Journal of Maternal-Fetal and Neonatal Medicine, 24, 1-4. Young, H. N., Schumacher, J. B., Moreno, M. A., Brown, R. L., Sigrest, T. D., & McIntosh, G. K., et al. (2012). Medical student self-efficacy with family-centered care during bedside rounds. Academic Medicine, 87, 767-775. Zou, D. Z., Sisterhen, L. L., Sigrest, T. E., Biazo, J. M., Aitken, M. E., & Smith, C. E. (2012). Family experiences and pediatric health services use associated with family-centered rounds. Pediatrics, 130, 299-305.